This is Chapter-2.1 of Oracle SOA 12c Step by Step Installation Series. Before this post, you need to read Chapter-1 and Chapter-2 of this series. As we know Oracle SOA 12c comes with lots of new features, one of it is integrated weblogic server which is chained to Jdeveloper. As mentioned this integrated weblogic server is chained to Jdeveloper that means when we close the Jdeveloper session weblogic server also shut down. We can also create default domain for integrated weblogic server, this default domain uses Java DB which comes with default installer. 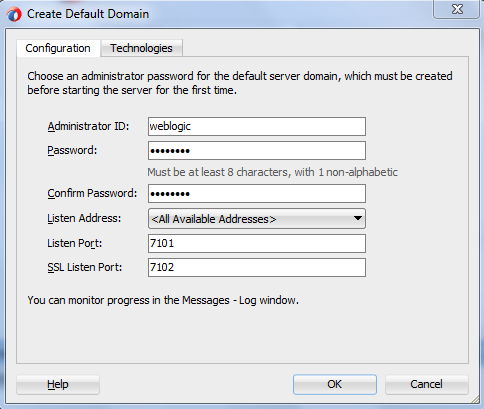 In this post, we see how to create Integrated weblogic server default domain. Prerequisites before creating this default domain. Installed Oracle SOA 12c. Read Chapter-1 for Oracle SOA 12c installation. 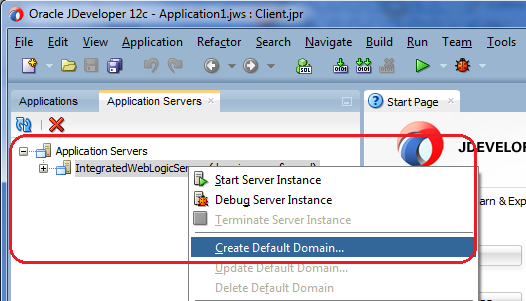 Right click on IntegratedWebLogicServer and click on Create Default Domain. Enter the domain password and accept defaults. wlst > com.oracle.cie.domain.script.jython.WLSTException: com.oracle.cie.domain.script.jython.WLSTException: com.oracle.cie.domain.script.ScriptException: Domain Extension Application Failed! wlst > Reason: Failed to query contents of table SERVICETABLE. wlst > Failed to query contents of table SERVICETABLE. i am getting same problum after intall while creating integrated server in jdev. Env: java 8 and windows 10, oracle SOA 12c.